Pomegranate molasses are similar to sugar cane molasses (aka treacle) in that they are made by boiling and reducing the juice. The difference is pomegranate molasses are purpose-made whereas sugar cane molasses are a by-product of table sugar production. Pomegranate molasses have a complex flavour: astringent, tart and sweet. They pucker the lips like red wine. The ingredient is widely used in North African and Middle Eastern cuisine, for example in the red pepper-walnut dip muhummara and the sweet-and-sour chicken stew fensenjan. 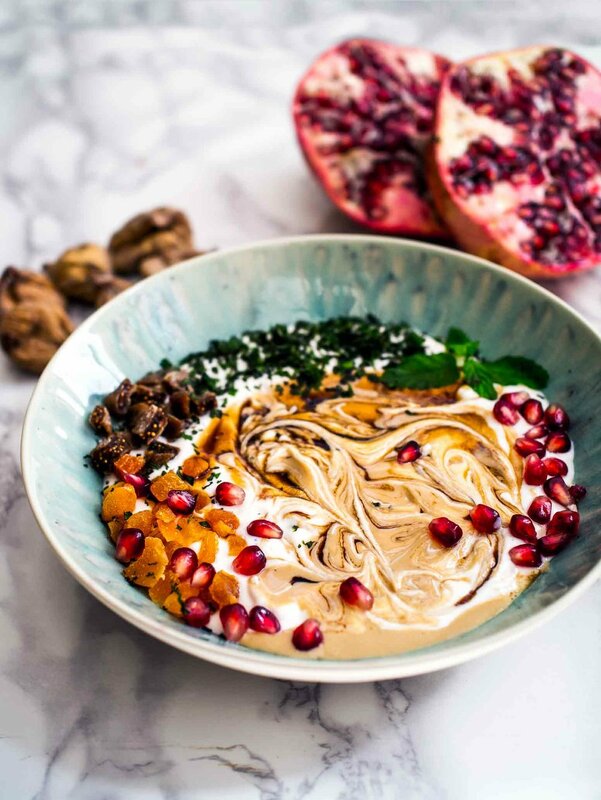 This breakfast bowl uses the combination of these pomegranate molasses with tahini. It adds a rich sharpness to every spoonful of yogurt – I use soya yogurt here as it’s less dominant than coconut yogurt, but that would work too. Mint and yogurt is a classic combination – think Greek tzatziki and Indian raita – and works perfectly here, adding freshness and vibrancy. Fruits such as dried figs, apricots, prunes and dates are very popular in the Middle East, so in keeping with the theme I’ve chopped up and scattered a few on top. But the main reason I like this recipe is because I like marbling things (only half-joking). Swirling the tahini-molasses mixture into the yogurt with a skewer produces a lovely marbled effect that guarantees your day will be full of beauty and joy*. 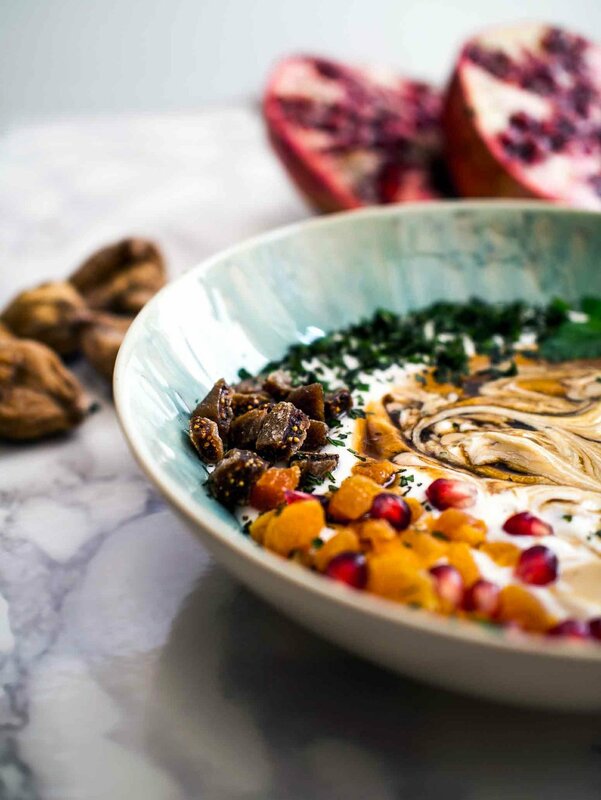 Put the soya yogurt in a bowl and top with the mint, dried fruit and pomegranate seeds. In a small bowl or ramekin, mix together the tahini and pomegranate molasses. If you want a more intricate marble effect as pictured, skip this step. Drizzle the tahini and pomegranate molasses over the yogurt and swirl with a skewer to create a marbled pattern, then serve. *this is an affiliated link. This means if you purchase through this link a tiny commission (at no extra cost to you) goes to supporting this website.